Pialgrip TT50 of Pialleport S.A., St Simeon de Bressieux, Isère, France, pictured by J M M at SIMA (Salon International des Machines Agricoles) at Villepinte in Feb 1997. Since 2001, Pialleport and Camox (skidders) are associated. Pialgrip TT50. Pict J M M.
Grillon 500 of Cinam built for transporting hives of bees. Top : 2nd prototype of Grillon of Cinam, 1989; middle : Pangolin tractor of CINAM then at Gibéroua workshop in Côte d’Ivoire in the 80s; down : Yeti Tractor of Cinam, 1984. These tractors were built for Africa. Today, Matrans Concept, Frontonas, continues to build little tractors and agricultural equipment. St Chamond Tractor Vigneron TC25, 1955, from Compagnie des Ateliers et Forges de la Loire, St Chamond, France. Pict J M M at Locomotion en Fête, La Ferté Alais, 2011 05. Tracked Mehari of review : 'L'Autojournal', May 1, 84. Tracked Mehari Citroën whose kit Geo Cap in 1984 was designed by Georges Hildebrand. Pictures by J M M in 2003 at 2 CV Museum at Wakenbach, France. This museum will be moved at a new place at Troisfontaines near Sarrebourg in 2014. Tracked Mehari. Pict J M M.
Thiokol Imp 1404 R 104 R. See chap 'Thiokol and DMC tracked vehicles'. Thiokol, the first proto, 1963. Speed 16 km/h, 90 kg payload. See chap 'Thiokol and LMC'. Amphibians of Rock Island Arsenal, 1922 with Christie tracks. Picture from book 'US Military Tracked Vehicles' of Fred Crismon, Motorbook International Publishers & Wholesalers, 1992. Motorbook International Publishers & Wholesalers, 1992. Bradley Angleworm 10 tractor from Bradley Tractor Company in the 30s. Elevated drive sprocket, 46,5 hp, only 8 km/h. Cletrac Model HG-42 was a commercial model built during WWII, intended to use in New Guinea. Fenders must protect personal and surrounding foliage and rubber blocks were used on tracks. Picture from book of Fred Crismon ‘US Military Tracked Vehicles’, Motorbook International Publishers & Wholesalers, 1992. Crosley, T 37 Light Tractor, Mule, 1943. Picture from book of Fred Crismon ‘US Military Tracked Vehicles’, Motorbook International Publishers & Wholesalers, 1992. Crossley T28 and T28E1, 1942-43 as prime movers to push a sled. It uses the same principle of the Snow-Motor of Ted Flynn Forest Service of Oregon with the track surrounding the engine. Four built by Crossley Corp., Cincinnati, Ohio. Picture from book of Fred Crismon ‘US Military Tracked Vehicles’, Motorbook International Publishers & Wholesalers, 1992. Dura Kat, 1964, from Page & Page. Picture from book of Fred Crismon ‘US Military Tracked Vehicles’, Motorbook International Publishers & Wholesalers, 1992. Syracuse Engineering Office support vehicle, 1923. Picture from book of Fred Crismon ‘US Military Tracked Vehicles’, Motorbook International Publishers & Wholesalers, 1992. T70 Snow Tractor, 1954. Picture from book of Fred Crismon ‘US Military Tracked Vehicles’, Motorbook International Publishers & Wholesalers, 1992. Trac-Pack, late 60s. Picture from book of Fred Crismon ‘US Military Tracked Vehicles’, Motorbook International Publishers & Wholesalers, 1992. AEROHODA, 2009 from the region of Demidovka. Storm, of SUV Society, Tver Region, Russia. Tracked vehicle from SCC Cayman, St Petersburg. Maharayka pusher of Eugene Chuchin. Fluffy from Luaz 969 with tracks. SCC Cayman tracked vehicles about mid-2000, known as 'Hermine'. From St Petersburg. Yukon homemade ATV from Russia seen on Internet. Tracked homemade ATV from Russia seen on Internet in 2011. Technomaster Ruff TM-02 for snow only. Very light, 50 kg, speed 25 km/h, autonomy 50 km, it is designed to fit in the trunk of a car. Produced since 2007 in Russia. Personal Tracked Vehicle & Magic Carpet,TWIN PACK plans. Snow vehicle Itlan, probably home made in 2009 in Russia. ITLAN ATV from Engineering Center 'Itlan', Rybinsk. ATV of Syktyvkar and Tokmakov, 2008-2009. http://www.samodelkin. ATV of Nicolas Bogoslovksogo, homemade. Tracked Vehicles, prototypes from 1965 to 1974 at Polytechnic Institute of Gorki (downwards and from left to right) : GPI-17 in 1965, GPI-19A in 1966, GPI-37A in 1967, GPI-2904 in 1977, long time operated in northern regions of Russia. GPI-C20 Snowmobile prototype designed in 1947 by Gorki Polytechnic Institute, Nizhny-Novgorod, was inspired by B2 Bombardier. GPI-2904 tracked personal carrier, 1977, studied by Polytechnic Institute of Gorki, Nizhny-Novgorod. Uhtysh ZVM-2410, designed from 2003 by Alexander Anikin to transport 5 passengers + 50 kg. Equipped with bilge pump and winch, it is manufactured by JSC 'Zarod Off-Road Vehicles' founded in 2004 in the region of Nizhny-Novgorod. The technology was issued from Nizhny-Novgorod State Technical University. (ONILVM, formerly Gorki Polytechnic Institute). Tracked vehicle for road and airfield construction on ice, digging, trenching and laying of communication in the Permafrost. GAZ-53 cab. ATV 600 tracked Eagle. From Popular Mechanics Sept 1969. Creep tractor for firefighting in Ontario, to transport equipment over rough mountain. Pict from Popular Mechanics, Nov 1950. Kapsen Iron Horse for forestry, manufactured by Reparoservis Company born in 1995, Pragua,Czech Republic. Power 16 hp, mass 690 kg, speed 4-6 km/h. Owren Tiller, end of the 50s. Built by Trygve Owren in Norway, it was used with success in summer for agriculture and in winter for forestry work . This one was rebuilt in Norway with help of Trygve Owren at the same spot where Variotrac (below) was built. Owren Variotrac 912, 1983, 45 hp, mass 3,5 t, hydraulic transmission and electro-hydraulic winch. Tryge Owren AS began his company in 1951 at Lillehammar, Norway. Variotrac was developed with customers to work in drilling, mines, timber transport and winching. Owren work with Forest Research of Norway and fitted its skills to Prinoth and Hagglünds, whose groomers are sold in Norway. The Owren 400 cable skidder is well-known in forestry. Schneewiesel K 2000 (Snow Weasel) from Kahlbacher was produced at about 80 units in 1968-1969. The cab, engine and gearbox were from the Haflinger fitted on a special chassis, creating a tracked Haflinger. From Tyrol, Austria. Aveling Barford Calfdozer, 1954, was used by railways for back filling. This Construction Equipment brand, since 1934, became part of Leyland Group in 1967 and nowadays of Wordsworth Holding in Grantham, GB, which filed for bankruptcy in early 2010. Bauchet Tractor from Retel, Ardennes, non-restored, pictured by J M M in 2004 outside Maurice Dufresne Museum, Azay-le-Rideau. Cletrac Model F, 1920-1922, incorporated an innovative new track system using a specially designed roller chain. So it didn't need roller tracks. The track width and ground clearance could be easily adjusted. Picture J M M from Heidrick Museum, Woodland, CA, on June 2001. Gardette Vineyard Tractor, 1956, at Maurice Dufresne Museum, Azay le Rideau, 2004 10. Pict J M M.
St Chamond Tracked Tractor, Loco en Fête, La Ferté Alais, May 2000. Pict J M M.
Tracteur St Chamond of the 60s pictured by J M M at Locomotion en fête, La Ferté Alais, France on June 5 1993. Stock and Cletrac tractors, Maurice Dufresne Museum, Azay le Rideau, on 2004 05 06. Pict J M M.
Tracked tractors from La Réole Museum near Bordeaux on 2004 04 20. Unfortunately, this interesting museum closed one or two years later. From L to R and A to B : Bernard, 1939, Cletrac : Cleveland Tractor & Co., 1935, W type 42 hp, Ransomes 1938, Cletrac. Bernard Tractor. Pict J M M at Loco en Fête, La Ferté Alais, 2008 06. Bernard crawler tractor, 1939, 5 hp at Maurice Dufresne Museum, Azay le Rideau, on 2004 05 06. Pict J M M.
Non-restored tractors from outside of Maurice Dufresne Museum, 2004 10. Above left is a Bauchet tractor. Pict J M M.
Vaughan Flex Tread crawler tractor manufactured in Portland, Oregon in the 30s. Mass about 350 kg. It was on sales on ebay in 2005. Vermorel Tractor, 1930, from Société d'Exploitation des Tracteurs Vermorel, Villefranche sur Saône, France was the smallest tractor marketed at that time. It was conceived by H Bauchet. Tracked tractor, light. Pict Francis Pierre, 2000. Neuson 3003 at Forexpo, Bordeaux, 2004 04 21. A non-driven roll help to stability. Pict J M M.
Neuson RK 20 S Snowcat from Linz, Austria. 13 km/h, slope 100%, ground pressure 0.14 to 0.32 kg/cm², mass 2630 kg, payload 2500 kg, 48 hp Yanmar engine. Pict J M M at the auction of Moerdjick, The Netherlands, on March 2003. Neuson RK 20 S Snowcat from Linz, Austria. Pict. Francis Pierre, 1995. Transporter for forestry at Forexpo, Bordeaux, 2004 04 21. Pict J M M.
Transmanut tracked automotive 1 to 2.5 t payload. Transmanut, St Gervais La Forêt, France. It seems that Transamut of Ames Group, Vineuil, does not build this vehicle anymore. Transamut tracked vehicle. Pict J M M, Euroforest, St Bonnet de Joux, 2010 06. Mini Transporter Ibea from Italy, Pictured by J M M at SIMA, Villepinte, 2005 03. One or Two Tracks Barrow. It seems to be Othsu tracks in mid 60s. Tracked wheelbarrow, 1927. Pict from the book 'Roadless' from Stuart Gibbard, Farming Press 1996. Orolo tracks, Roadless, 1927, were made in different sizes. This little one was mounted on a wheelbarrow or on a searchlight during WWII. A couple of hundred was built by Roadless. In 1930 Orolo G2 with rubber jointed shoe tracks was built for 12 t payload and lasted until the 60s. Pictured by J M M at Duxford Museum (not far from Cambridge), GB, August 2002. Mobil Trac System of Caterpillar, seen at Intermat, Villepinte, April 1994. 6 t capacity, 60-80 km/h, ground pressure : 520 g/mm², 40 units were in service with French Army in 1994. Pict J M M.
WD-type chains were used on ordinary twin-tyre equipment in British Army to enhance mobility of 6x6 trucks in the 40-50s. Note the single wheel track. Pict from the review 'Classic Military Vehicle', Apr 2004. Orolo tracks on servitude vehicle for Air Force. Pict J M M at Overloon Museum, 2009 03. Tracks seen at Intermat, Villepinte, in May 1991. Above is a Bobcat, down is a part of a Massenza cold planer (or asphalt milling machine). Pict J M M.
Skid-steer Tracks for compact excavators. Soucy tracks from Canada. Pict J M M at Villepinte, June 2012. Camoplast rubber track HXD. Brochure says : no steel exposed for more durability, low friction inner guide minimizes heat. From Canada. Pict J M M at Intermat, Villepinte, 2012 04. 6x6 tracked, 1964-68, Wisconsin V-4 engine. From Mille-Lac Corporation, Ogilvie, Minnesota. Mulag RM 50 from the 80s, Germany. Mulag RM 40, in the 80. ARIS off-road vehicles. Above a wheeled service vehicle with trailer and below a tracked carrier from about late 2000. Aris Spa is located at Lombardore, Torino, Italia. J M M archives. Snow Eagle ATV-600 from Maccormack, first seen in 1970, had 39 hp engine, the most powerful at that time, and could run straight at 70 km/h and 45 km/h in wood roads. Good off-road capabilities and fun, this kind of snowmobile had not to be stored when spring arrived. Personal Tracked Vehicle, from Russia. Bollens Diablo Rouge Snowmobile, 1968. The rear sled allows to move only on snow. Snowcat in Great North, Canada, in 1947. Pict from 'Popular Mechanics' (French Edition), Jan 1948. Hawk Snowmobile, 2 tracks, 2 persons. 50 built in the 60s. Ben-Augus Caribou from Ben-Augus Industries, Lambton, Frontenac Country, Quebec in 1971 was a four season snowmobile without skis and steerable by the 2 tracks. 20 hp Kholer engine, speed about 60 km/h, 163 kg mass. Two tracked Ben-Augus model Caribou in 1971 were built by Benoit Giguère et Augustin Veilleux from Lambton, Belleshasse, Québec. It is a snowmobile without front skis. Dahlco 3000, Cedarbug, WI. From the 60-70. Arnold and Ranger tractor, from Minnesota, had the same look. F. Pierre archives. Arnold Ranger V. F. Pierre archives. Softrack Loglogic was launched in 1998. Loglogic is at Cullompton, Devon, GB. A bigger Bigtrack allows 5 t payload. Pictures of J M M at Forexpo, Bordeaux, June 2002. Softrack Loglogic. Pict J M M.
Softrack. Pict J M M at Euroforest, St Bonnet de Joux, 2010 06. Eurotrack 100 of TSI, subsidiary of Metalliance. Pict from 'Mécanisation Forestière', June 2008. Metalliance-TSI tracked vehicle. Pict J M M at Euroforest, St Bonnet de Joux, 2006 06. TSI (Triangle Service Industries) Métalliance. Pict J M M at St Bonnet de Joux on 2006 06. TSI-Metalliance Tracked vehicle. Nice vehicle ! Pict J M M at Euroforest, St Bonnet de Joux, 2006 06. TSI-Metalliance Tracked vehicle. Pict J M M, St Bonnet de Joux, 2006 06. Tracked carrier Metalliance-TSI. Pict J M M at Euroforest, St Bonnet de Jou, 2010 06. Eurotrack of TSI at SIMA, Villepinte, Feb 1999. TSI is part of Metalliance Group, Monceau les Mines, France which built mechanical machines and little tracked vehicles. Pict J M M.
Eurotrack de TSI-Metalliance. Pict J M M at Euroforest, St Bonnet de Joux, June 2003. Eurotrack de TSI-Metalliance. Pict J M M.
MGM Tracked Armann Quad from the 2000s, Italy. MGM Full Tracked Armann Quad. Pict below from the review 'ATV, L'Officiel du Quad', Nov 2000. Poncin, 8x8 tracked for firefighting. Pict J M M at Val d'Isère, Aug 1990. Poncin tracked vehicles at Val d'Isère in Agust 1990. Created by Gilles Poncin at Tournes, Ardennes, in 1974 he produced many ATV 6x6 and 8x8. The MUT like 4x4 and 6x6 of the new Sedan plant in 1990 did not sell and Poncin closed in 1992. Pict J M M.
Poncin VP2800 Amphibian of the 80s. 35 hp Citroën engine, 60 km/h on land, payload 1 t, Picture was taken by J M M at Chindrieux near Le Bouget Lake (vehicles are used for mosquitos' control) on 24-25 May 1996. Poncin VP2800 Amphibious vehicle. Pict J M M.
Scot Trac Glencoe in 1996 at Villepinte, France. Pict J M M.
FlexTrac MPV and snowmobiles were built between 1982-89 in limited production by Finncat Vehicle Oy, Posantie, Finland. They had no skis and were fitted with original bendable tracks, driven by a sprocket in the middle of width of the track. The vehicle could run on other grounds than snow. J M M archives. Flextrac MPV, Lambesc, France, August 1993. Pict J M M.
Finncat Snowmobile from 1980 with flexible steering track made of elastic plastic segments like an accordion. Guidance and drive was by the middle of the wilderness of the track which could bend right or left. Built by Finncat Vehicle Oy, Posantie, Finland. Raybach tracked prototype, 1979, Olié, Eure et Loire, France. Ground pressure 70 g/cm², 1,1 T, Citroën transmission and engine. Originally, Raybach tracked vehicle is a Playcat, Drummonville, Quebec. Pict from revue 'Agrisept', Feb 1980. Easyrider Twin Tracked All-Terrain vehicle ATV. This one dates from late 70s. It was built by Consolidated International, Inc, Colombus, Ohio. Sold on ebay in 2004. Playcat from Playcat Industries Inc, Drummonville, Quebec. Pict from the site Joeygarage. PassePartout ATV or PPT introduced in late 60s. In 1977, the production moved from Quebec to Alberta and became Valquentin Industries for a more industrial vehicle. In 1980, the plant moved again in Michigan. Twin Bay Industries Inc., who manufactured the PPT, stopped production in 1985. Iseran 1 of Montino Company, Italy, used for snowy grounds. With Ami 8 Citroën engine, it should be built 8 copies. Seen at Tractomania, Caussade in 1996. Pict from the review 'Charge Utile', Feb 1996. Aktiv Fischer Snow Trac was manufactured from 1957 to 1981 in Sweden. This one stays in Saumur Museum and pictures by J M M dates from July 1998. Snow Trac Aktiv ST4 of Westerasmaskiner AB Company, Sweden, produced the first Snow Trac in 1957. Steering wheel connected to an electrical dimmer helps continuous steering. It was exported all over the world until 1981. A larger version appeared in 1968, the Trac Master. Pict J M M at Saumur Museum, France, May 2006. Aktiv ST4 Trac Master. This larger version appeared in 1968. Saurer Motormuli M30/M60 or Muli Steyr of 1956 spotted in Bad Ischl not far from Salzburg, Austria. For agricultural, forest work and Posts. Diesel Steyr 4 cyl Engine 30 or 60 ch. It was the successor of RSO. Pict from review 'Wheels and Tracks' N° 16, 1986. Tucker Sno-Kitten of the 50s. Pict. Francis Pierre, 1998. Snow Kitten of Tucker Snocat Corp., Portland, Oregon. Engine 10 hp. The track shoes had rollers which rolled on an outside ring. Only 110 were manufactured from 1957 to 1962. Bombi of Bombardier. See chapter : Bombardier : travel on snow. Bombi Ski-dozer of Bombardier or BRP. 100 built since the 70s to 2009 when Camoplast sold BRP to Prinoth of Leitner Group. Prinoth, P4 with wide summer tracks. Prinoth AG from Sterzing, Italy, part of Leitner, has bought in 2005 Bombardier tracked vehicles plant at Valcourt. P4 was built from 1968 to 1977. V.TTP.O. Tracked vehicle of June 1983 at Satory. Pict from review 'Military Machines International', Aug 2001. Scaled model of a tracked vehicle by Nicolas Straussler, 1934. Each track is mounted on girder which pivoted on the hull side supports, the swinging movement being controlled by springs. Pict from the review 'Wheels & Tracks' N° 38 1992. Scaled model of tracked vehicle. Pict from the review 'Wheels & Tracks' N° 38 1992. Vertrax Electric Tracked Skateboard was a project in 2010. Magnatrac II, Cedarburg, Wisconsin. Pict Collection of F. Pierre. Stair climbing machine in Japan seen on youtube : The_Stairs-climbing_Machine. Many stairs climbing machines exist. Digga Augers from Australia. Pict J M M at Intermat, Villepinte, 2009 04. Green space maintenance Groundsmaster 7200 (upper) and TX 525 (middle) of Toro. Toro Company exists since 1914 and is based in Minesota. Pict J M M at Forexpo, Bordeaux, 2008 06. /3_9/showthread.php?t=9510. See chap "CHANGES AROUND THE TRACK III"
Small ATV Otter born around 1966 with plastic snow tracks over balloon tires. Transmission on each side is composed of 2 small and 2 large cones in contact with control sticks. Rubber track tractor, pictured by Jagliego Brothers at St Loup, Nièvre, France in 2006. From 'Revue des Engins' N° 19, of Aipethoac of Francis Pierre. Oxtrac (before : Forcat) of Tremzac Equipments, St Bonaventure, QC. Tremzac Equipments was founded in 2001, not far from Drummonville. 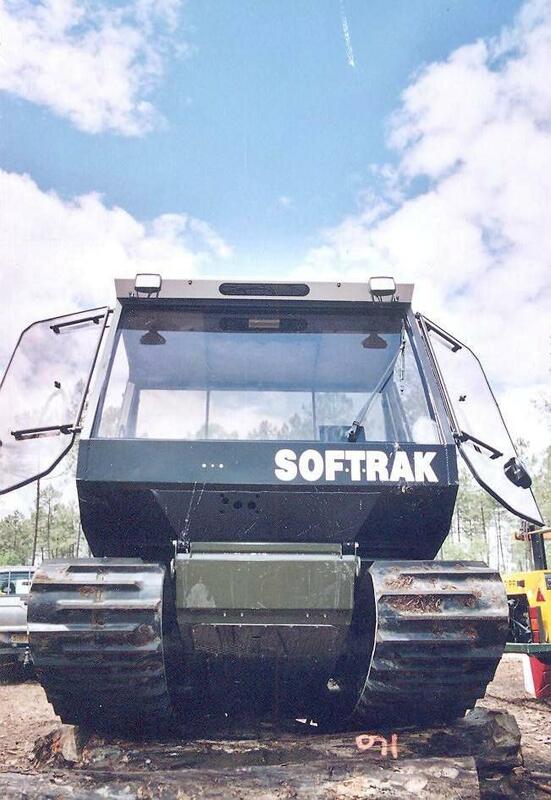 It acquired rights of Tracked Oxtrac skidders in 2008 for multi-use as forest firefighting, construction, industry, agriculture. Traxmax is a 6x6 Max of Recreative industries, Buffalo, New-York, fitted with tracks. Kristi Water Walker, 1962, was a KT-4 fitted with floating tracks. The hull remained above water. It was evaluated by US Army, TACOM, Michigan, during RAVE demonstration. Picture from book of Fred Crismon ‘US Military Tracked Vehicles’, Motorbook International Publishers & Wholesalers, 1992. Upper : MS Brandenburg tracked vehicle from former Eaest Germany in the 50s or 60s. Below : Piko Anker space tank toy 'Saturn' remote control, from East Germany in the 70s. Independant suspension. J M M at Paris, 2012 11. Tracked RC toy of mid 2000 sold in France under the brand Majorette. J M M at Paris, 2012 11. Tracked vehicle on ebay in 2005. Tracks are from a Carden Lyod Bren Carrier of WWII. US003068950-001 Adjustable motor-driven invalid chair with endless tracks, 1962. US003311424-001 Belt driven by soft roller, 1967. Messieri tracked dumper and loader. Pict J M M at Intermat, Villepinte, 2006 06. Small Forest Machines, from L to R and U to B : JH Järnhästen of Electromakan i Ärjäng AB, AM LM Skogshanter Goliath 520, track deformation on obstacle, JH 125 Järnasten, Tritrac of Söderhamns konstruktionsbyr ä AB. Pict from the book of Tomas Nordfjell 'Small machines for off-road transportation. Studies of basic properties' from Swedish University of Agricultural Sciences in Garpenberg, Report N° 169, 1986. Lennartsfors forwarder. Pict J M M at Forexpo, Bordeaux, 2008 06. Iron Horse. Pict J M M at Intermat, Villepinte, 2012 04. Iron Horse Husqvarna. Pict J M M at Euroforest, St Bonnet de Joux, 2006 06. Iron Horse. Pict J M M at Euroforest, St Bonnet de Joux, 2010 06. Iron Horse for forestry of Lennartsfors, Ärjäng, Sweden. 9 hp, Mass 330-460 kg, Unveiled in 1982 by Jonsered, it became an alternative at big machines. 7000 copies were manufactured for its 25th anniversary, between 1984 and 2009. Iron Horse Husqvarna from the 80s for forestry work. Iron Horse of Lennartsfors climbing onto a slope. It was unveiled in 1982 by Jonsered. Forstraupe A2100 from Aggeler AG, Steinebruun, Switzerland. Forestry Mule Sifer, mid 80s. 58 kW, hydrostatic transmission, width 1,4 m. Pict from 'Motorisation et Technique Agricole', Nov 1984. Efco tracked barrow. Pict J M M at Euroforest, St Bonnet de Joux, 2006 06. Crosley Mechanical Dog, 1943, intended to replace huskies hauling sleds. Pict from the book of Bart H. Vanderveen ‘The Observers Fighting Vehicles Directory WWII’, Warne, 1972. Brushcutter from Camuc. Pict J M M at Euroforest, St Bonnet de Joux, 2006 06. Mobile electric chair for disabled, rubber tracked, 1947, called 'Gleep'. Invented by E.C. Gleason, Everett, Washington. Many inventors patented and built more or less complex and unsuccessful off-road chairs (wheeled, tracked or legged). Pict from 'Popular Mechanics', Nov 1947. Agria-Werke 1952-63, Möckmuhl, Germany, for forestry work. 5-8 hp. Pict from the book of Richard H Robinson: ‘ Crawler Tractor Scrapbook’ Part Three, Country Life Ltd, New Zealand. Also called 8 PS-Agria-Universamraupe Type 2800 'Trabant', from Deutsche Raupenschlepper of Wolfgang H. Gebhardt, Schrader Verlag, Stuttgart, 2000. Hummel DE 52 SL, 1952, from Heitersheim, Germany. With 10 hp, it was a garden tractor with a seat. http://mototracteurs. Anglerworm of Bradley Tractor Co, 1935. C12 from IMT Tractors Ltd, Scunthorpe, GB. 12 hp, 9 km/h, mass 780 kg, Pict from the book of Richard H Robinson and Alfred Meyer : ‘ Crawler Tractor Scrapbook’ Part Four, Country Life Ltd, New Zealand, 2001. Cutia utility tractor in a museum of Rio de Janeiro. It looks like VP90 (See chap : Two Tracks Rigid vehicles, Medium) http://italie1935-45. Ford 1210 made in Japan, 1999. Pict from the book of Richard H Robinson and Alfred Meyer : ‘ Crawler Tractor Scrapbook’ Part Four, Country Life Ltd, New Zealand, 2001. Life Track of OSE, Open Source Ecology (www.opensourceecology.org) wich is a multi-tasks economical tool holder. Pict of SVJ August 2011. Loxam mini crane. Pict J M M at Intermat, Villepinte, 2012 04. Lugong loader. Pict J M M at Intermat, Villepinte, 2012 04. Morrish tractor CT 1703, 1994, from Tiverton, Devon. 37 hp, hydrostatic drive, 9 km/h, mass 1000 kg. Pict from the book of Richard H Robinson and Alfred Meyer : ‘Crawler Tractor Scrapbook’ Part Four, Country Life Ltd, New Zealand, 2001. Niko HY 48-2000 vineyard crawler, 1999, from Niko Gmbh, Baden, Germany. Pict from the book of Richard H Robinson: ‘Crawler Tractor Scrapbook’ Part Three, Country Life Ltd, New Zealand, 2000. Powa-trac 36, 1993, from Jersey Channel Isles. Pict from the book of Richard H Robinson: ‘Crawler Tractor Scrapbook’ Part Three, Country Life Ltd, New Zealand, 2000. Schmiedag Tractor. See Chap 'Tour of Speyer and Sinsheim museums'. Pict from J M Maclou, Locomotion en Fête, La Ferté Alais, 2012 06. Tooltrak of Loglogic. Pict J M M at Forexpo, Mimizan, France on 2012 06. Panther TG-4 tractor from Panther Tractor Corp, Dallas Texas. Pict of the book of Richard H Robinson: ‘Crawler Tractor Scrapbook’ Part One, Country Life Ltd, New Zealand, 2000. 60 series Yamnar dumper, payload 600 kg, hydrostatic transmission, 3.6 km/h. Pict J M M at Intermat, Villepinte, 2012 04. Battenberg 15-PS Tractor built by Hans Battenberg, Bayern, Germany, in 1949. It was exhibited at Frankfurt Agricultural Show in 1950. Pict from the book of Wolfgng H. Gebhardt, published by Schrader Verlag, Stuttgart, 2000. Battenberg wheeled or tracked tractor, 1949. Pict from the book of Wolgan H. Gebhardt : 'Deutsche Raupenschlepper', Schrader Verlag, Stuttgart, 2000. Blank V228-230-232, 1965, of Karl Blank K.G. Dirmstein, Germany, 25-30 hp. Pict from the book of Wolgan H. Gebhardt : 'Deutsche Raupenschlepper', Schrader Verlag, Stuttgart, 2000. Unirag of Karl Blank, 1951, for orchard work. 8-10 hp, in 1957, Germany. Blank produced his tractor himself. Pict from the book of Richard H Robinson: ‘Crawler Tractor Scrapbook’ Part Three, Country Life Ltd, New Zealand, 2000. Lunic Tractor of Unirag of Karl Blank, imported in France by Ets Blanc (Unrelated family Blank), Agde, Hérault, Later, Blanc produced the Lunic under license at Lunel near Nîmes, in the 50s. In 1961 occurred agreement with Staub (Coubevoie). Pict of J L Jagliello at St Loup, 'Revue des Engins' of AIPETHOAC of F Pierre, 2007 11. See also : http://tracteurdevigne. Tracteur Vidal, 1937, 30 hp, for wine yards. Georges Vidal was known for its agricultural straddle tractors. Pict from 'Revue des Engins' from AIPETOHAC of Francis Pierre, 2011 09. Issoise tractor, from Paris, whose tracks were built under license Bristol. Issoise became independent in 1941. From 1940 to 1950, 120 units were built but production ended in mid-50s. Picture from the book of Christian Descombes : ‘Encyclopédie des tracteurs fabriqués en France des origines à nos jours’, ETAI, Boulogne-Billancourt, 2001. Fouga B, built from 1948 to mid-50s by Etablissements Fouga et Compagnie, Béziers, France. Pneumatic wheels drived the tracks. Picture from the book of Christian Descombes : ‘Encyclopédie des tracteurs fabriqués en France des origines à nos jours’, ETAI, Boulogne-Billancourt, 2001. Nejdanovskii chenilette, 1924. Pict from book of Alain Dupouy, Auto-éditeur : 'Les véhicules tout-terrain N° 11 Tome I'. 1995.